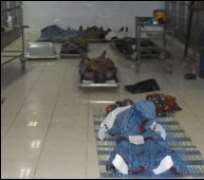 A hospital in Nigeria has told the BBC it is overwhelmed by the number of corpses being bought to them by police. The Chief Medical Director at the University of Nigeria Teaching Hospital in Enugu says his staff are being forced to carry out mass burials. The BBC has established that at least seven people were last seen alive in police custody, accused of kidnapping. Enugu State Police Commissioner Mohamed Zarewa told the BBC he was too busy to talk about their case. Nigeria's police have faced strong criticism from human rights groups for carrying out extrajudicial and arbitrary killings. The BBC has visited the morgue and taken photographs. The images are disturbing. They show piles of young men, lying on top of one another and strewn about on tables and floors. In places the corpses are stacked four or five deep. Records show 75 corpses were delivered to the morgue by police between June and 26 November this year. The Chief Medical Director of the hospital, Dr Anthony Mbah, says his staff were forced to carry out a mass burial of between 70 and 80 bodies some weeks ago. He says that another mass burial is planned to take place soon. Seven of those in the morgue were arrested, accused of kidnapping, and paraded alive in front of the media in early September. But their names appear in the morgue register - on 15 and 16 of September. Police Commissioner Zarewa told the BBC he was unaware of the number of young men lying dead in the morgue. He says his officers are forced to engage armed robbers in gunfights and that many police officers are also killed. He insists that his police force operate within the law.